Let's assume you would like to split shipping method between two payment methods: bank money transfer (BACS) and cash on delivery. How would you configure Cash on Delivery WooCommerce then? In order to achieve this, you need our Active Payments plugin. After you configure it properly, your client will see only payment methods assigned to the shipping method he chooses. Create new shipping method by clicking Add new and name it (e.g. Air Post). This will be the shipping method assigned to cash on delivery. Add another new shipping method and name it (e.g. Courier - cash on delivery). This will be a method assigned to money transfer. When you open Active Payments configuration page, you will see both shipping methods. In order to hide one of the payment methods from your client when he chooses a particular shipping method, just select a box within the table. 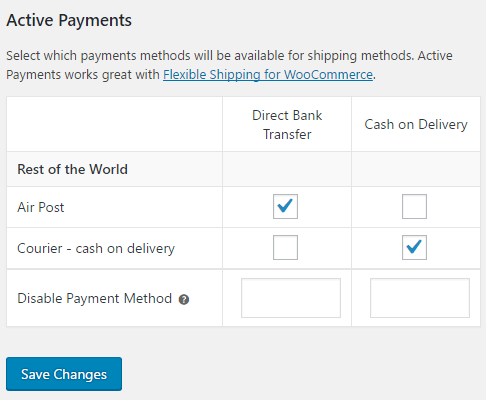 You don't need Flexible Shipping to properly create Cash on Delivery WooCommerce method. Active Payments plugin works with vanilla WooCommerce. You can use the Flat Rate for example. Of course without Flexible Shipping, you can't configure dynamic pricing of a shipping cost. And this is a big loss!